Lungfuls of salty sea air, white gulls soaring on the breeze, colourful beach huts, the crash of the waves… there really is nowhere like the English seaside. Nestled right next door to the poetry-inspiring South Downs, Eastbourne offers a peaceful alternative to the hustle and bustle of Brighton. Once famed as a retirement spot, it now has an up-and-coming alternative scene. Here are 12 reasons to head for the charming Victorian seaside town of Eastbourne. 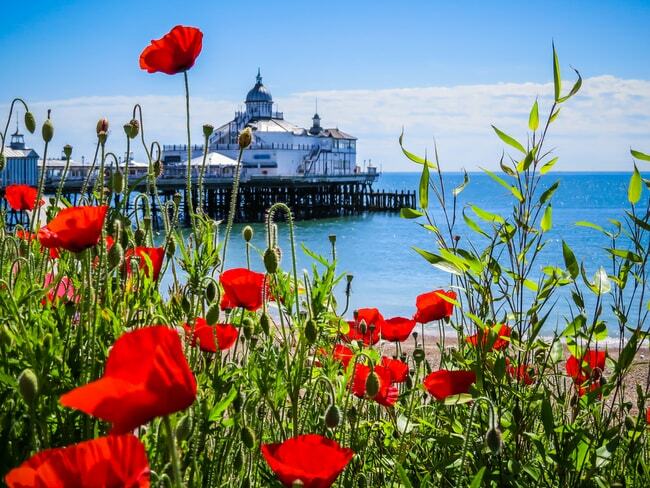 While the UK is famed for its blustery weather, and umbrellas are a just-in-case essential for most of the year, Eastbourne boasts some of the sunniest weather in the country. Rolling into the picturesque town by rail from London, you’ll be welcomed with a cheerful sign to ‘The Sunshine Coast’. In 2012, the town was named the sunniest spot in the UK and its blue skies make Eastbourne an impressively photogenic destination. Don’t write Eastbourne off as all seagulls and sunshine; there’s also a wonderful art gallery not far from the centre that should be on your to-do list for the town. The award-winning Towner Gallery exhibits contemporary art, including a collection from East Sussex’s own Eric Ravilious, whose watercolours of the South Downs capture the countryside you’ll be surrounded by. In 2009, the collection moved to a new building and brings a contemporary feel to this traditional town. Eastbourne has a truly beautiful coastline. There are magnificent cliff-top walks to be enjoyed at Beachy Head, the highest chalk-sea cliff in the UK, where views of the candy-striped Beachy Head Lighthouse are postcard-perfect. Travel along the coast by bus to the unmissable Seven Sisters cliffs, where sheep scatter the hillsides and the sea stretches majestically towards France. ‘Material Girls’ (and boys) can easily spend a day wandering the fabulous shops of Eastbourne. First there’s the shiny new shopping centre The Beacon (currently transitioning from the well-loved Arndale Centre) which has sleek high-street stores and plenty of cute pit stops for mid-spree sustenance. If you’re hoping for a more unique experience, head to the Little Chelsea area – Grove Road and South Street – moments from the railway station. Here, you’ll find charming second-hand book stores including the brilliant Camilla’s (where paperbacks are stacked floor-to-ceiling), record shops like The Vinyl Frontier and the Chelsea Antiques Emporium. Charity-shopping is also a must in Eastbourne, as the numerous stores let you pick up high-street labels and quality granny-chic items for next to nothing – and all for a good cause. Nothing says English seaside like a morning on the pier. Built between 1866 and 1872, the quaint Victorian pier is 300 metres long and is Eastbourne’s number one attraction for a reason. There’s a delightful Victorian tea room where you can enjoy a classic cream tea, watching the waves crash from beneath a twinkling period chandelier as 1950s big band jazz floats from the speakers. Make sure you have plenty of change for the colourful slot machines afterwards. The sound of 100 two-pence-pieces crashing into the slot for you to collect is a childlike thrill worth gambling a penny for. Regardless what time of year you visit Eastbourne, a paddle in the bracing British waves should be on your to-do list. You’ll see many locals walking their dogs along the pretty Eastbourne seafront, breathing in fresh sea air. Tuck into a fish and chip feast to boost your courage and roll your trousers up for a brisk splash in the shallows. A Mr Whippy ice cream (chocolate flake optional) makes a fitting reward in any season. Many visitors and residents make the most of the waves as surfing, kayaking and serious sea-swimming are all year-round options. Eastbourne’s Wish Tower, built to defend against Napoleon in the early 1800s, and the seafront Lifeboat Museum are both worth a peek. At the far Western end of the town’s seafront you’ll find Holywell Beach, nestled underneath Beachy Head and its striking white cliffs. Along with beach huts in postcard-worthy reds, yellows and greens, there are rock pools at low tide just right for investigating. The 200-year-old Redoubt Fortress was reopened in March 2017 after restoration works and now visitors can enjoy lively tours from costumed guides bringing the Napoleonic era back to life. Entry is free to the fortress and the space plays host to a lively programme of events, such as stargazing with Eastbourne Astronomical Society. Airbourne is Eastbourne’s annual air show and something residents are extremely proud of, for good reason. World-famous aircrafts and heart-stopping acrobatic displays from teams such as the Red Arrows are the reason why thousands flock to the town every summer. With the skies full of zooming planes and swirling vapour trails, this is an event not to be missed. Live music, water sports and a range of food stalls add to the festival atmosphere. As well as its dreamy coastline, Eastbourne offers easy access to poets’ favourite, the South Downs. The rolling green hillsides are a must-see and there are lots of excellent walks, many of which include an English essential – the pub lunch. 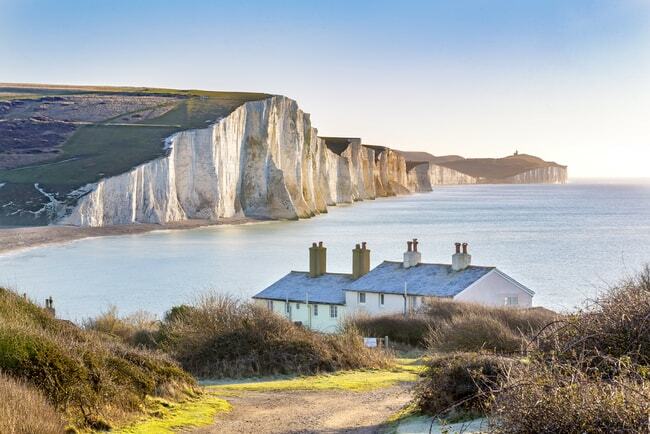 Start with a swift half pint of local cider at the Tiger Inn, East Dean, then march five-and-a-half miles taking in Seven Sisters and Birling Gap before ending up right back where you started for a well-earned roast dinner. 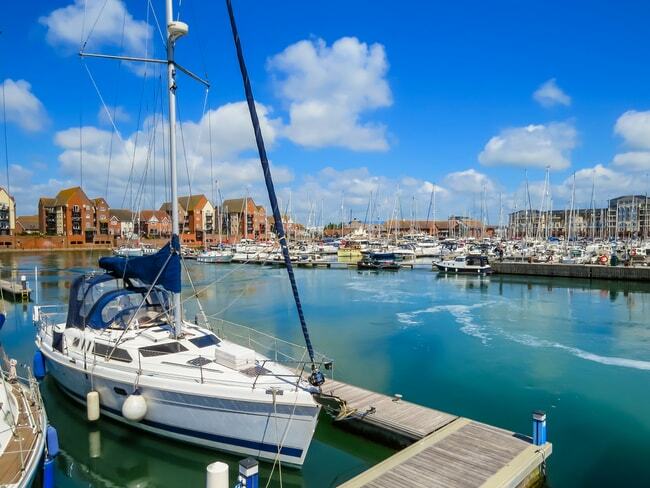 Although Eastbourne has a reputation as an idyllic retirement spot, there’s much more nightlife and sparkle to this town than meets the eye. Eastbourne’s bandstand may first appear as nothing more than a great shot for your Instagram feed, but the attractive 1930s structure is also said to host more events than any other bandstand in the country. With space for 1,400 people to sit, Eastbourne Bandstand is a gorgeous seaside spot to watch live music and is also available to hire for weddings. For live comedy, head back to Grove Road to Printers Playhouse which opened in 2015 and is a quirky, cosy venue to enjoy music and theatre from the heart of Eastbourne’s arts community. There’s also the Royal Hippodrome Theatre which recently received funding to revamp its ageing facade and hosts musicals, plays and dance performances all year round. You’ve filled up on fish and chips by now (and they’re more about the experience than the actual eating anyway). So it’s time to discover something really delicious. Veggies and vegans will love the colourful, flavoursome brunches at Nelson Coffee (it’s opposite the railway station) where the fish and meat options are great, too. For lipsmacking pizza, try Pomodoro e Mozzarella or Mamma Mi and for moules frîtes, you can’t go wrong with a visit to newly opened eaterie The Beach Deck. For your caffeine fix, Beanzz coffee shop is unpretentious and the sandwiches are seriously tasty, too. There’s even a monthly Farmer’s Market in Eastbourne’s Old Town, selling fresh local produce, home-made cakes, crafts, jewellery and other gift items. Brunch | © Nelson Coffee Co.